Now, then. Aberdeen see off Hearts to move within a point of league leaders Celtic. Partick Thistle win at Tannadice to heap more misery on Dundee United; Ross County come from behind to beat Hamilton and Motherwell prove too strong for Dundee. 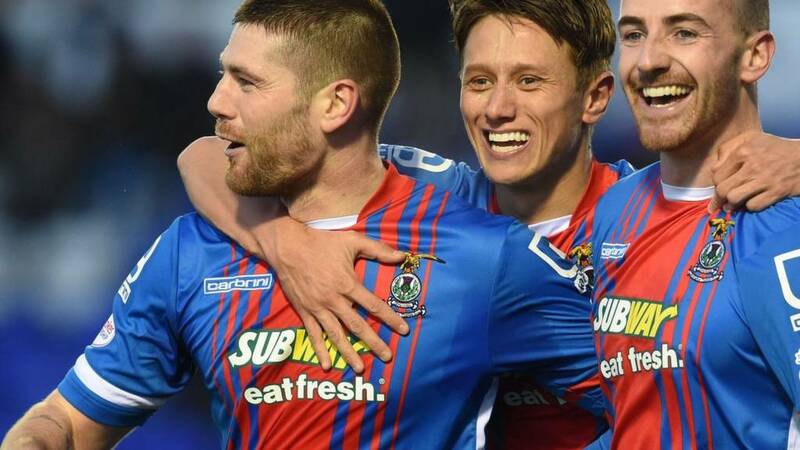 And an Iain Vigurs-inspired Inverness CT see off Kilmarnock in the Highlands. Thanks for your company this afternoon. Highlights of all today's games will be on our website from 18:00 GMT tomorrow; join us tomorrow lunchtime for St Johnstone v Celtic from McDiarmid Park. Some breaking news tonight as St Mirren part company with manager Ian Murray. Enjoy you Saturday night, cheers. Ian Murray has resigned as St Mirren manager. Murray joined the Buddies from Dumbarton in May but six months later find themselves third bottom of the Championship and haven't won a home game this season. "I'm delighted with a clean sheet and the three points. It wasn't a great game of football and I thought the first half was a poor spectacle. "We didn't really get the ball moving but it opened up in the second half. We're delighted to get three on the trot after such a bad start to the season." Stephen Pearson gets to the near post and meet the right hand side cross, knocking the ball over the line. A double sucker punch for Accies. No sooner had Stewart Murdoch fired County in front, the visitors extend their lead as Liam Boyce scores a third to surely seal the points. Killie captain Mark Connolly gives his side a glimmer of hope as he heads home in Inverness. Can they find a late, late equaliser? It's getting nervy for Motherwell. Paul McGowan's cross from the right meets the diving head of Greg Stewart, but he puts it well side from close range. A distraught Stewart has to be lifted back up off the ground by his team-mates.